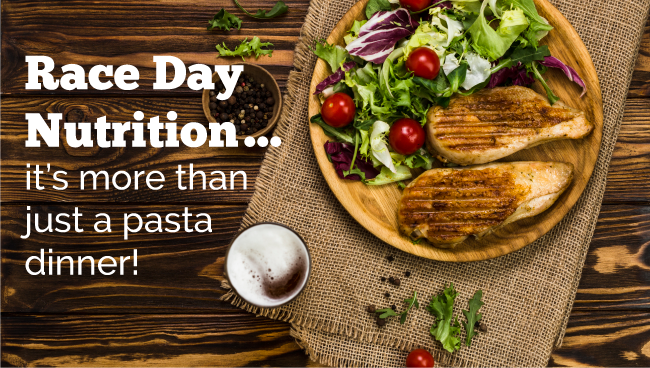 Race Day Nutrition…it’s more than just a pasta dinner! Nutrition for the big race doesn’t start the night before. Just like training takes months, nutrition training should start well in advance to make sure that you are ready for the BIG day. Remember, that everything you do in the days before the race, on race day, and during the race itself, should have been tested-out in training. Here are a few easy to follow guidelines to ensure that you are ready once to gun goes off. Ensure that you are eating a variety of foods from all food groups, including vegetables and fruit, grain products, milk and alternatives, and meat and alternatives. Another important aspect is ensuring that you are hydrated as dehydration can lead to a decrease in performance. The goal for meals would be to include at least three of the four food groups and for snacks to include at least two of the four food groups. For hydration, aim for light yellow colored urine (not apple juice yellow) by drinking fluids throughout the day. The goal for your pre-race meal is high carbohydrate, moderate protein, low fat and low fibre…and don’t forget fluids! The goal during the race is fluid intake and for longer events, electrolyte and carbohydrate intake as well. This is important to enhance physical and mental performance, prevent injury, delay fatigue and spare protein. Remember to start ingesting carbohydrates from the start of the race. Slowly work on building your intake in training, and try different combinations of solids and fluids and different brands to see what works for you. What you eat/drink should help you stay mentally and physically ready to compete, it should not give you stomach problems. Recovery, recovery, recovery! Although the race is (finally) over, nutrition is still important! Follow the 4R’s to recovery to help with soreness and fatigue in the days to follow: Rest with sleep, Rehydrate with fluids, Replenish with carbohydrates, Repair/Rebuild with protein. – Have a snack before you head home from the race by taking advantage of all the great food that is offered once you cross the finish line! Have more questions on how to get race ready, fueling during your race and/or on enhancing your recovery? 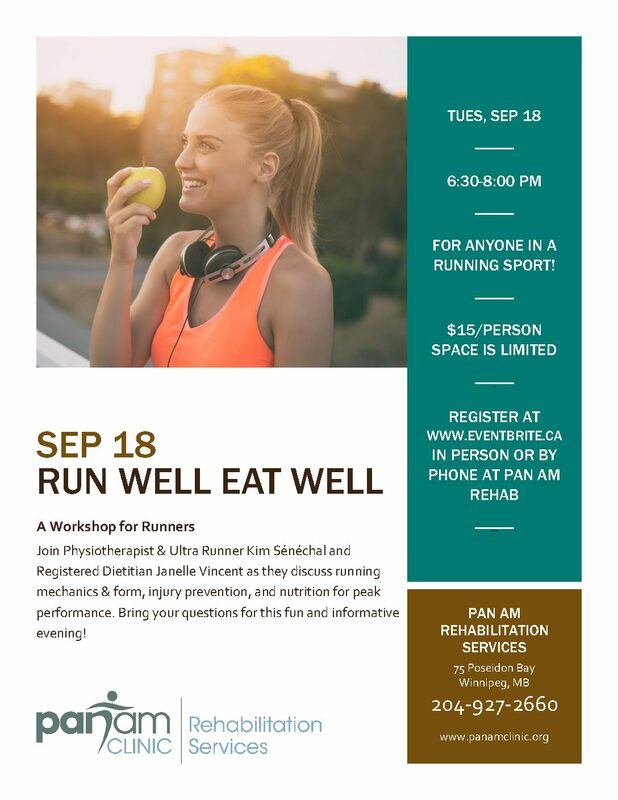 Contact Janelle at the Pan-Am Clinic (204-927-2660) to book your nutrition appointment and take the next step in optimizing your performance. WHY IS EVERYONE TALKING ABOUT CADENCE? Cadence is the number of footsteps per minute, also known as stride rate. The ideal cadence is between 170-190 steps per minute. Similar to checking your heart rate, count the number of steps when running over 15 seconds and multiply by 4. Wearable can be used to assist with checking cadence. Why is cadence so important? 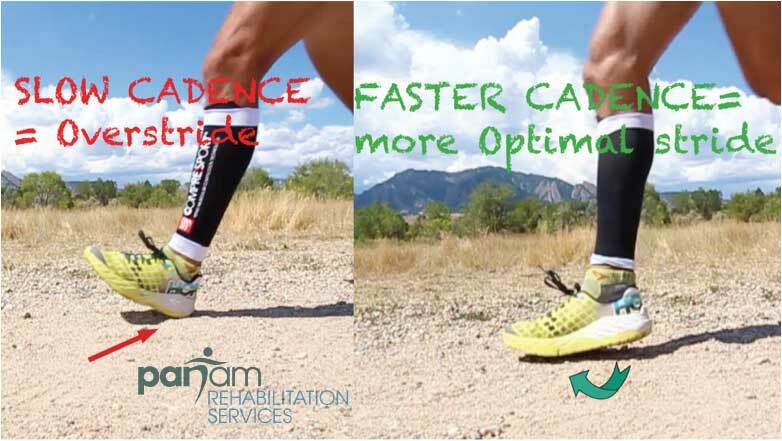 Increasing cadence will allow the runner to be more efficient, reduce impact, reduce heel strike and most importantly reduce and correct over striding. Over striding is the most common mistake made in recreational runners and the reason for many running injuries. The ideal and most efficient landing position of the foot is when it lands underneath you, ie: your center of gravity. Over striding is when the foot lands outside the center of gravity, typically in front of the body, resulting in a higher heel strike angle. This will increase the ground reaction forces traveling up the leg, making the runner more susceptible to injury. Another reason why a higher cadence is advised is simply because it reduces the amount of time the foot spends on the ground. The longer the foot is on the ground during stance phase, the more ground reaction forces will impact the body. Optimal running includes getting the foot in and out of stance phase as quickly as possible, limiting time spent on the ground, propelling the runner forward and ultimately improving efficiency and preventing injuries. Shorten your stride and run gently. Try to run as quietly as you can. Imagine that you are running over hot coals or over thin ice on a lake. Focus on smaller steps. Check your cadence at the beginning, middle, and end of your run to see how it varies with warm up and fatigue. Run to a beat by using a metronome app on your phone in 30-60 sec intervals during your run or download music by beats/minute from Apple Music, iTunes, or Spotify. Try cycling or spinning for 5 minutes before your run at a high RPM, then running. See how briskly your feet want to move! After your runs, slip off your shoes and run for 2-3 x 30-50m on grass in your bare feet! From my own personal experience, changing your cadence will feel very weird at first. It is definitely something to get used to. A common mistake runners make is to simply run faster. The best advice I could give a new runner trying to improve their cadence is to not focus on speed. Cadence should be trained independently from speed in those beginning phases, best done on a treadmill while maintaining a consistent speed. This will improve overall efficiency and over time speed will also increase. See the link below on YouTube for more information re: using a metronome. WHY SOMETHING SO RIGHT FEELS SO WRONG! 1.) Place one hand in the center of your chest pressing into the breast bone. 2.) 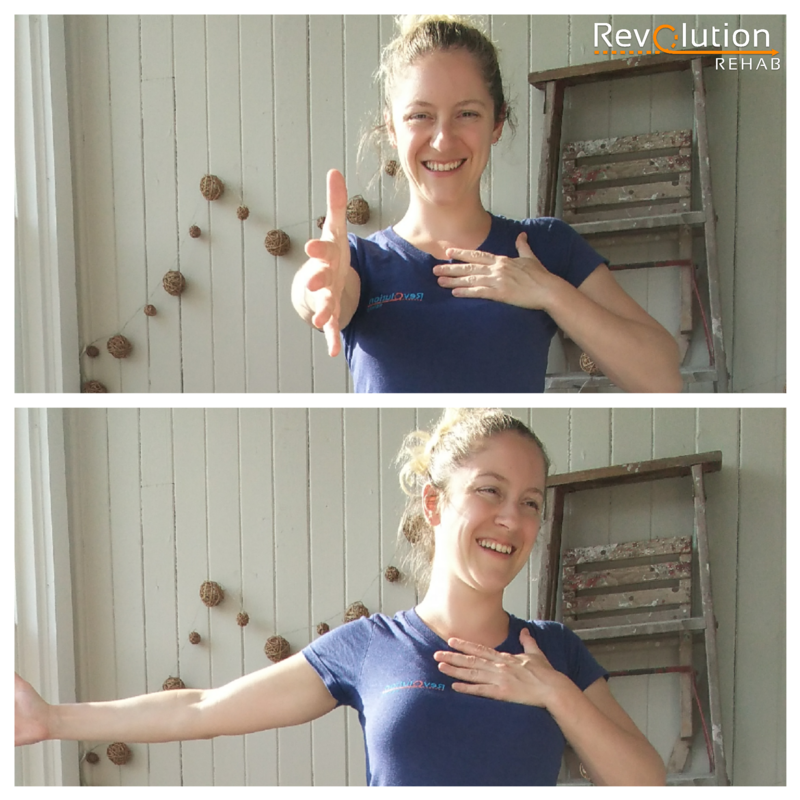 With the other arm straight in front, open the arm to stretch the pec while at the same time the opposite hand pulls the skin on the breast bone away from the moving arm. 3.) Hold for one second and reset to the starting position. 4.) Repeat up to six times on each side. POSTURE – WHY SOMETHING SO RIGHT FEELS SO WRONG! We all know that good posture is, well…good! Especially in running, correct posture decreases unwanted pressure through your back and neck, aligns your body so breathing is more efficient and helps negate a lot of chronic injuries and pain by promoting muscle balance throughout your body. Why then, does “correct” posture feel so awkward and uncomfortable? Simply put, we live in front of our bodies – from typing on the computer, to driving, from texting, to washing dishes, our actions are generally executed forward from our core. This promotes a hunched over position with frontward rounded shoulders and a forward head poke. You know which posture I’m talking about! In the clinic, we call this upper cross syndrome. So now when you go to straighten up during your run, your back posture muscles are not only at a structural disadvantage, but they’re also fighting gravity, plus all those locked and short front muscles! I would be cranky and tense too if I had to work as hard as those poor postural muscles do! Create a habit – every time you check your phone or watch, sit-up or stand-up slightly straighter. Over time, this habit change will start creeping into your running. Don’t force it into your running! If you lift weights, try two back (pulling) exercises for every front (pushing) exercise. We’re already forward, so now you’re just evening out the playing field for your posture muscles! Spend time doing range-of-motion exercises, stretches or physical therapy to help lengthen and unstick those short, locked front muscles. Some ideas are: heart-opening yoga, pec massage work and pec stretching, or anything where you are promoting extension through the back and opening through the chest and neck. Now your back is not fighting your front! Your body uses less energy to hold you upright, it has greater room to breathe, and allows for more efficient movement of your limbs not only in running but in daily activity! Better posture in running also creates an environment where injury is less likely, and that is something we can all stand-up for! If you haven’t yet made it out to the ABAS AUTO STONY MOUNTAIN RUN – you really need to consider putting it on your Fall race calendar! This year’s event is our fourth annual and is on September 22nd. Early bird discount ends on August 31st, so don’t delay! Stony Mountain provides a great location for an event like this with a combination of quiet town roads and wide/smooth scenic gravel trails through the forests and old quarry. Actually, the Run is the prime fundraiser for the development of the local walking/running trail network and a new section will be built just in time for the Run! Oh, and did I mention the hills? Yes we have hills!! We also offer custom finisher medals for everyone and awards (complete with podium!) for the top three male and female in each event. Also, for those youth members, our 3K event is part of the MRA Youth Series. Event/distance details provided below and more information at the links provided (including Running Room registration link). ALL-FAB OLYMPIC – 10K QUARRY RUN: Timed event. Finisher medals. Medals for top three female and male runners. Registration cost $20 (early bird), $25 (regular) or $30 (late/race day). Start time 10:00am. DEPREZ & ASSOCIATES PWM – WHAT THE HILL 5K RACE: Timed event. Finisher medals. Medals for top three female and male runners. Registration cost $20 (early bird), $25 (regular), or $30 (late/race day). Start time 10:15am. NOTE this is a change from past years where each runner ran 1 mile. Timed event. Finisher medals. Registration cost $20 (early bird), $28 (regular), or $36 late (race day). Start time 9:45am. SUNOVA STONY SCAMPER: 3KM fun walk or run. Open to all ages!! Timed. Finisher medal. Medal for top three female and male runners born 2005 or later. Part of MRA Youth Series. Individual Registration cost $15 (early bird), $20 (regular), $25 (late/race day). Family rate $45, $60, $75. Start time 10:15am. 2018 T-REX TOONIE RUN: Short sprint for Kindergarten and Pre-school age children. Registration $2.00 on race day (no online registration). Start time 9:40am. 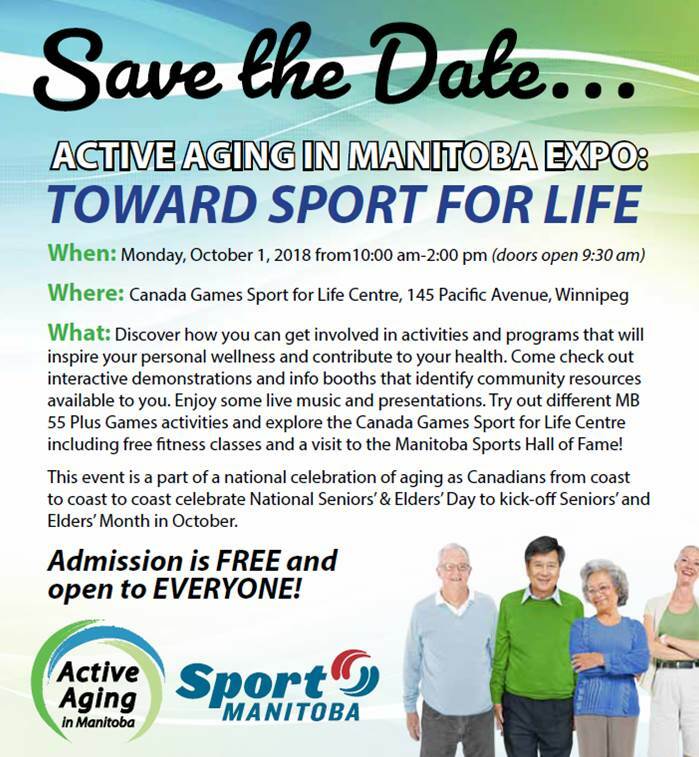 Active Aging in Manitoba (AAIM) formerly known as ALCOA-MB, is collaborating with Sport Manitoba to present the 2018 Active Aging in Manitoba Expo: Toward Sport for Life on Monday, October 1st, 2018 at the Canada Games Sport for Life Centre, 145 Pacific Avenue in Winnipeg. Save the date and plan to participate! For more details contact: jevanchuk@sogh.mb.ca or call: 204-632-3947. Please feel free to share with anyone who may be interested. We hope to see you there! Each registered runner will receive a FREE technical shirt (while quantities last). After the run/walk, participants will be treated to a hot breakfast. We challenge runners and walkers to be creative and dress up for this event. There will be a prize for the most creative outfit. Each registered runner will be included in a prize draw at the conclusion of the race. We’d greatly appreciate your help. ONLINE REGISTRATION FOR THE MRA FAMILY ICE CREAM RUN ENDS TONIGHT! Online registration for the MRA Family Ice Cream Run #1 1k & 2.2k closes at midnight tonight. Avoid the line-up and register online for our first Ice Cream Run on Wednesday, July 4th 7:00pm at Crescent Drive Park in Fort Garry. On-site registration is also available by filling out the entry form and bringing it with you. This is probably the least expensive event you’ll do all year and you get ice cream at the finish line! Individual registration is $10 and families with up to 6 members living at the same address are $20. Register for both of our Ice Cream Runs at the same time (series) and get a $5 discount. Strollers and dogs are welcome! 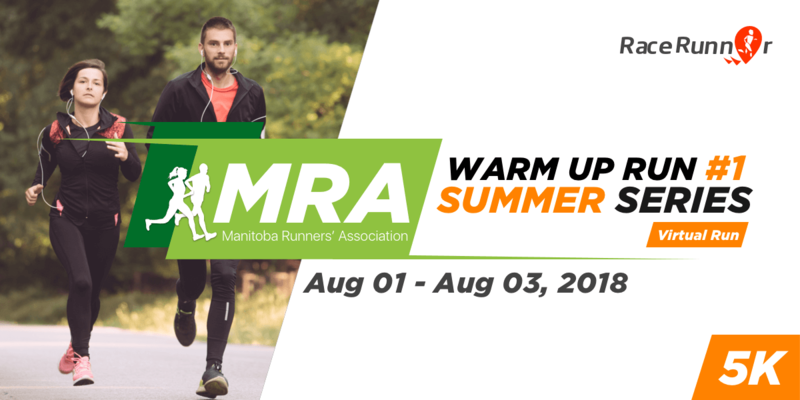 Both the 1k and the 2.2k are part of the MRA Youth Race Series.